Marshyangdi River rafting is considered to be the hardest or the most challenging River for rafting; however, it has recently been much loved and demanded rafting trips in Nepal. Marshyangdi River is descended down form looming Himalayan giants of famous Annapurna region and passes through along the route of round Annapurna trekking, beautiful villages, guarding temples on the river bank with uninterrupted class 4 to 5 rapids. Marshyangdi River is situated in the Annapurna Range in Nepal, is considered one of the best rivers in the world for rafting. 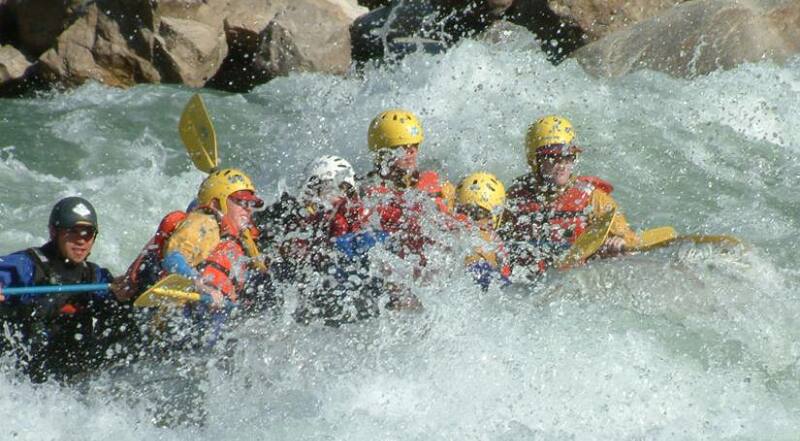 It is exhilarating especially for whitewater with impressive mountain backdrops. The rafting trip in Marshyangdi River commences with a deep and pathless gorge, which slowly descends to arid landscapes, long high ridges of far west mountains, which draw the attention of every rafter. The rafting in Marshyangdi brings you across varied natural features like valleys, hills, gorges, canyons and jungles. The trip starts with a tough busied road from Dumre to Besisahar from there you trek up to the village called Ngadi, from where you can see the great views of Manaslu and the Annapurna ahead of you, then you start your rafting trips from Ngadi downstream to the end of the trip at Bimalnagar. It is the pretty much solid white water, rapids are steep. River equipment should be transferred by road.